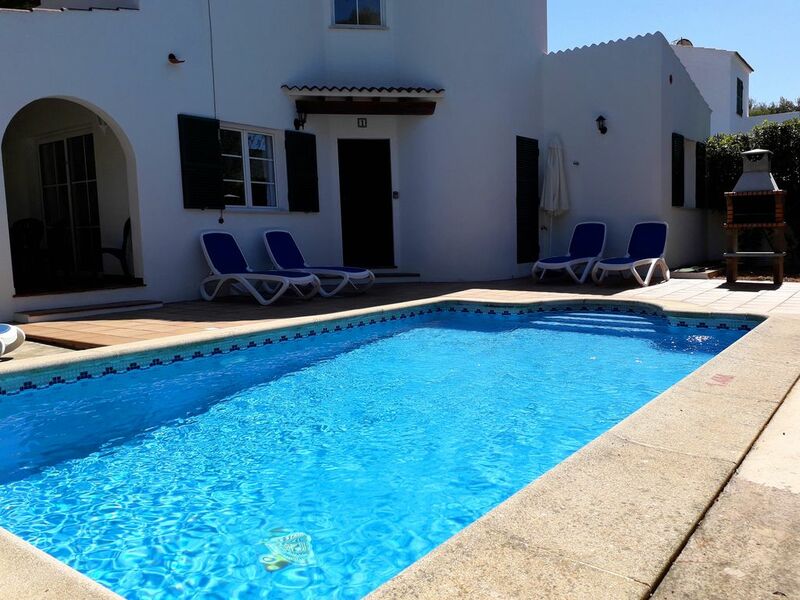 It´s a very beautiful villa with all the amenities just 100 meters from the beach, with two double bedrooms,one room with two bunk beds, 2 bathrooms, lounge, kitchen, grill, terrace and pool,to spend a comfortable and unforgettable vacation. On arrival at the home will find a brochure explaining leisure activities, gastronomy, sports, and places to visit in our beautiful island of Menorca, reverva Biosphere by UNESCO. 100 meters from the house is the taxi and bus, which connects the urbanization with other coves on the island and the center of town. The bus stops at intervals of 15 to 20 minutos.En the urbanization find restaurants, supermarkets, paddle tennis courts, pharmacy, disco, pubs, playgrounds etc. The island is home to an endless series of beaches, there is something for all tastes, from long sandy beaches to secluded beaches where bathing in its waters, but Menorca is not just beaches, the variety is much broader. On arrival at the home will find a brochure explaining leisure activities, gastronomy, sports, and places to visit in our beautiful island of Menorca, reverva Biosphere by UNESCO. Menorca offers many entertainment possibilities that is easy to find the paradise you Search is the magic nights of Menorca is all the charm of the island: Concerts in the moonlight in natural settings, crafts Minorcan outdoor markets, natural caves converted into nightclubs hanging over the sea from a great cliff, bars and terraces in the charming port. If instead they are looking for tranquility, nature and the bucolic landscape of Menorca gives you a great peace and can live an authentic bienestar.También Minorcan night at an ancient cave fishing, listening to traditional sea songs accompanied. Called the island of wind is the dream scenario for sailing, windsurfing etc. You can rent boats, golf, scuba diving, horseback riding, hiking and many more. We had a fantastic holiday in Cala Blanca, the house is clean, quiet and well equipped. Belen was extremely helpful and good to know she was there if we needed her. The house is within walking distance of many restaurants and only a short walk from a beautiful small beach. If you do book this house, I would recommend you go to the beach early evening to watch the sunset, it is perfect. We hope to return to your property Belen, thank you. The landlord was very helpful and polite. The house was very clean and well kept, it looks exactly like in the pictures. We had a very pleasant stay! Todo perfecto, lo único que nos chocó un poco fue el tema de la limpieza de la piscina, se nos dijo que pasarían 2 veces y siempre pronto por la mañana, para que no incomodase. Realmente pasaron 3 días, y dos de ellos a las 13:30 y a las 17 de la tarde, con lo cual era un poco incómodo ya que invadía un poco la intimidad en la propia terraza a esas horas. Aún así, por lo demás, perfecto, la verdad, muy contentos. Casa fantástica con todo lo necesario para pasar unas vacaciones 10, y con tu mascota! todo facilidades. Had a great 9 night stay at this cosy, practical apartment with my wife and 4 grown children and had plenty of room when you count the outside space. Nice size pool, big enough for a splash about all surrounded by a small enclosed garden area gives you all the privacy you need. Upstairs, a good sized double bedroom with air conditioning, en suite bathroom and small balcony was a major plus while at ground level, the two double rooms with twin beds were ample for the big kids - there’s no air conditioning for these rooms but large quiet fans were supplied. The outside barbecue was a handy addition a few times during our stay and the kitchen area was practical with enough utensils for everyday use - although the noisy washing machine does take some getting used to but I’m sure Belén will replace this sooner rather than later as I don’t think it has much life left in it! The living room was often used as a chill out area after we had been out for the night mainly because this is where the second air conditioning unit is situated. With the apartment on the quieter side of the bay there are some good bars and eateries nearby all within 5 minutes stroll but not so noisy as to disturb your sleep. The beach is close at hand and if you venture to the other side of the bay you will find lots more bars, pubs and restaurants that cater to all needs. For your essentials there is a small supermarket close by but for a bigger shop we went to Julia’s by the strip on the other side of the bay and right opposite is a lovely and inexpensive restaurant called Jenny’ but you would be hard pressed to find a poor menu anywhere in Cala Blanca. Belén and Serafin were just a phone call away to answer any queries we may have had. If you want a practical base from which to explore the island and enjoy the lovely Cala Blanca then I would highly recommend staying here. Maison vraiment très agréable, description parfaite, nous avons était très bien accueilli par Serafin et Belen. Nous avons été très enchanté, par la propreté, apprécié la piscine éclairée la nuit, le quartier et cette île merveilleuse. Tout était parfait ! Nous reviendrons dès que possible, c'est certain ! If instead they are looking for tranquility, nature and the bucolic landscape of Menorca gives you a great peace.